Enterprises usually have significant investments in IT assets to execute their business and derive appropriate returns. These investments often are made over a period of time and spread across the technology spectrum i.e. spanning from legacy platforms to client-server system to more contemporary multi-tier browser-based systems. With the business landscapes continuously changing alongside the newer and better technologies, application maintenance can prove quite challenging. Surveys of IT spend indicates that organizations spend up to 70% of their IT budget on non-discretionary costs - in other words, costs to maintain current IT functionality and operations. Therefore, it is imperative that the costs of IT management and application maintenance becomes more effective and efficient, thus providing your business the edge to compete. Corrective maintenance - Fixing bugs in the code. 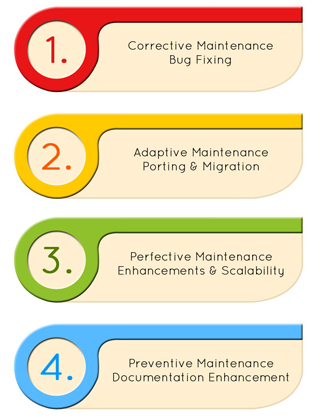 Adaptive maintenance - Making the software adaptive to new environments. Perfective maintenance - Updating the software according to changes in user requirements. Preventive maintenance - Updating documentation and making the software more maintainable. Frees up valuable IT staff and other resources for more strategic, core initiatives. Brings best-of-breed technology solutions to the task. Lowers cost of ongoing support.